How big is Apple’s Ecosystem? iTunes/Software/Services revenues grew at 12%. This was the second fastest segment growth last quarter, with the Mac growing at a slightly faster 13% rate. Apple mentioned in the quarterly earnings conference call the for the first nine months of its fiscal year (i.e. since September) the line item iTunes/Software/Services has been the fastest growing part of the business. The following graph shows the growth scorecard for Apple’s line items and it shows how the iTunes store is the only line that has been consistently green (growing above 10% for at least seven years. In addition to its revenues, iTunes can also be measured in terms of billings (or gross revenues). The billings growth rate is even higher at more than 25%. This is mostly to the more rapid growth of apps relative to a decline in music. 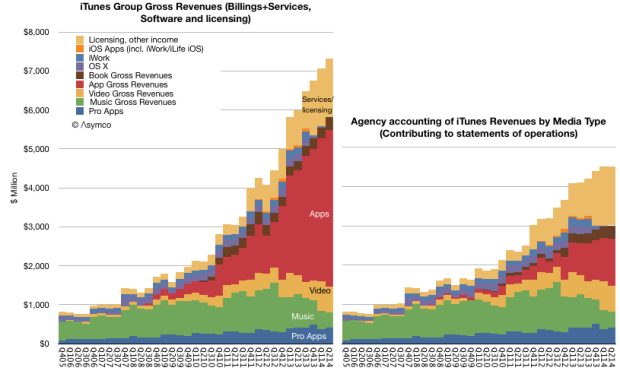 As Apple only records the 30% it keeps as “revenue” for apps the overall growth in apps is less visible in its accounts. Note the estimated split between media types and software and services. The software and services portion of the business had sales of $1.9 billion while the revenues from third party content/apps sales reached $2.6 billion. From the launch of the iPhone the value of Apple’s ecosystem has grown more than 600% which is faster than overall sales growth (approximately 400%). 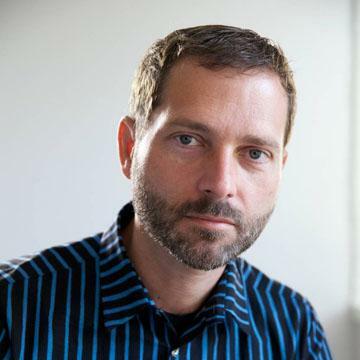 If ecosystem value grows more rapidly than underlying hardware sales the question that emerges is when would the ecosystem transaction value exceed that of the business is supposedly supports. Today the iTunes/S/S ecosystem is about $20 billion/yr. iPod, iPhone, iPad and Mac sales are about $150 billion/yr. It does not seem likely that the former will overtake the latter. If that were the case then one wonders why build a business entirely predicated on retailing and services without the support of hardware revenues. Something along the lines of Amazon.